What is the most important, enduring gift that one can give a child? Asked this question, almost everyone will say that they want to give children the ability to be happy. And they are right. There is nothing more important to give to any child—or, truly, to anyone, of any age. Read on to find out how this book can help you learn to do this—for your child, your young friends, and for yourself. Real happiness, for children and adults alike, is a profound matter. True and lasting happiness stems not only from the feeling of being truly and intelligently alive in all the dimensions in which one exists, but even more fundamentally from the sense of being awake to the Truth Itself, from the sense of direct participation in the Transcendental Spiritual and Divine Mystery in which we all appear. Since ancient times, it has been everywhere acknowledged that the deepest and purest human aspiration is to transcend the limitations of life and be restored to that sacred dimension, to the True Source or Divine Self of existence. However, it has not always been understood that this process and impulse is just as fundamental to children as it is for adults. This book contains Adi Da's profound Wisdom about the universal requirements of the human developmental process in the first three stages of life—including the conscious rearing of our children, as well as the ongoing growth challenges still facing most of us as adults. 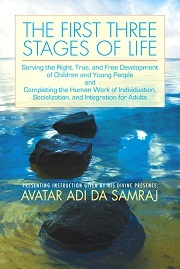 • To live as “I love you” and become sensitive to the dramatization of "you do not love me"
Avatar Adi Da tells us that children, at their own stage of development, are just as capable of devotional Communion with the Divine “Mystery of life” as adults are—and children need to feel It just as much as adults do. In this book He Offers comprehensive and detailed Instruction as to just how this is best done—providing crucial Guidance in what He calls “conscious childrearing”. He uses this term to emphasize that, in order to optimally foster the physical, emotional, and mental well-being of children, we must first establish in them a real and usable awareness of the Divine Mystery of their existence. And in order to serve that sensitivity in children, we must participate consciously in that Divine Reality ourselves. If you are involved with children, you will undoubtedly find directly usable Wisdom in every section of this book. You may also observe that the passages concentrating on the practical issues of conscious childrearing are addressed to you, the responsible adult. Other passages, interspersed throughout, are addressed directly to children themselves. I have always been remembering and feeling and breathing and loving and Being the Mystery. And I was born so that I could be everyone’s Friend—by Showing them the Mystery, and Teaching them about the Mystery, and Helping them to remember and feel and breathe and love and Be the Mystery.